General: "That, everywhere in the world, an end be put to all forms of terrorism." Mission: "That through the effort of believers, together with the living forces of society, the new and old chains which prevent the development of the African continent may be broken." Spread the word! Please post this graphic on your blog and let your readers know that they can post it on their blogs too! 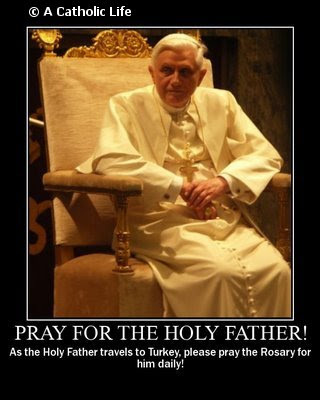 Fellow friends in Christ, between November 28th and December 1st Pope Benedict XVI will be journeying to Turkey. At this time in history, the Holy Father desperately needs our prayers. And the Rosary has been called the most powerful prayer after the Mass. At Fatima, Mary asked all mankind to "say the Rosary every day to obtain peace for the world and the end of [World War I]." And, concerning herself, she said, "I am the Lady of the Rosary." Start praying the Rosary for the Pope today! I will frequently post reminders about this on my blog for the next month. Thanks for this...I've saved it to post later on my blog. I have posted it on my blog, Mysterium Fidei. Thanks for the heads up.